Time for a bit of quilting. For you sampler lovers....there are a couple more posted at the end of this post. Don't miss them! This is a good day to show you how we do invisible machine appliqué. Barb and I don't have enough hours in the day to do everything by hand. We are able to complete many quilts in a short period of time by doing the appliqué by machine. It is not as relaxing and peaceful as doing it by hand....but we can get our quilts done in 9 - 30 days depending upon our deadlines. These pictures will give you an idea of the process. I will be posting a block pattern that you can try in the next day or so. And I will take some pictures of my machine set-up too. My husband (our official "web-helper") is visiting his Mom in Houston. He might be able to post the pattern from there...but I might have to wait until he gets back home. And I have to do the"spring cleaning thing"...so bear with me. Anyway....back to the task at hand. 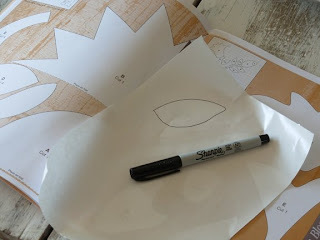 Use a fine tip marker and draw each template on the slick side of the freezer paper. Draw the reverse templates on the dull side. If multiples of one template are needed, cut up to six at a time by drawing one piece and layering it with six sheets of freezer paper. Stapling them together prevents them from slipping as you cut. Except for the bias tape, each appliqué piece will need a paper template. After all the pieces are cut out, iron the slick side of the paper template to the reverse side of the fabric. 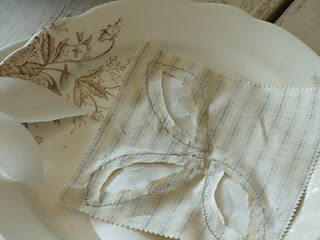 The heat of the iron will adhere the paper to the fabric. Cut out each piece, adding 1/8” - 1/4” seam allowance to all sides. 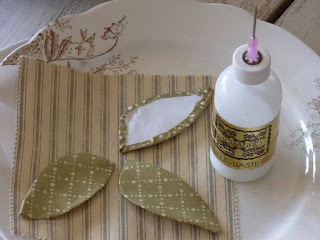 Use a glue stick to glue the seam allowance to the back side of the template. When complete, each piece “looks” finished. Position all of the appliqué pieces on the background block. 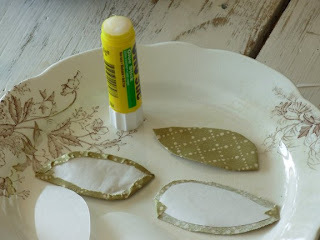 Pick up each piece and use dots of Roxanne’s Glue-Baste-It on the turned seam allowance and then reposition each piece on the background block. Repeat until all pieces are glued in place. After the pieces are stitched in place on the background block, turn the block over to the reverse side. Cut away the fabric from under each appliquéd piece leaving a 1/4” seam allowance. Dampen the block with cool water and wait about 5 minutes for the glue to release. 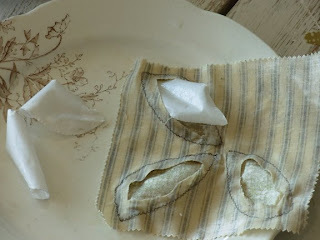 Pull the fabric on the diagonal both ways and the freezer paper will pop loose. Remove all the paper from each block. 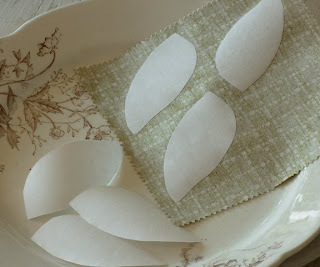 Place the block on a flat surface to allow the fabric to dry. More about this tomorrow....or Monday. Couple more sampler pictures. The first is from Edgar Mathews. "I used my maternal grandparents initials and the year they where married. You will recognize the bird and branch from BBD Pins and Needles. I used 36 ct Barn Owl and the floss' where - OWS, CC, GAST and a Six Strand Sweets. I also shifted and cleaned up some of the edges." Don't you love the sweet colors on these samplers? 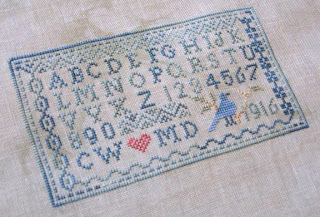 Judy Starkey stitched the above sampler. "I haven't decided how to finish it yet, I think I am going to use it on a cover of a scrap book I am going to make of Joy. I decided to dedicate mine to my sister, using her maiden name and her birth/death dates. I am one of 9 children and Joy and I were so close growing up, we spent so much time together, then she married and left home. As adults, even though we were separated by many miles we stayed in contact by phone and letters and visits. 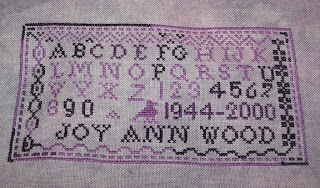 During her last 10 years of life she was very ill, but I continued to visit her once or twice a year in her home, staying a week or so at a time and we would do all kinds of needlework together. Throughout the years we taught each other how to knit, crochet, quilt, etc. In 1994 she taught me to cross stitch and I fell in love with the art. It remains to be my very favorite form of needleart and the one and only thing that brings me complete relaxation. I continue to miss my sister immensely, but I have many items she made me, many letters and cards she sent me but best of all I have the wonderful memories of us cross stitching together." Hmmmmm. 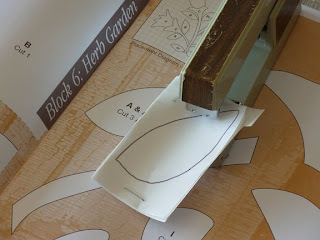 I've heard others say to use the blind hem stitch on the sewing machine to machine applique. All I need is a machine that can do that! lol! I'm still hoping that I can get one for my birthday. Maybe..... 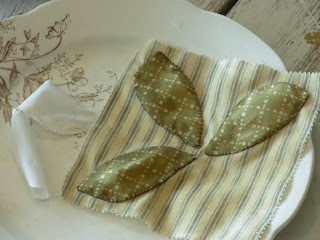 I love hand applique -- it's one of my favorite things. But it takes forever like you say! Hi Alma thanks for the instruction on this type of applique, it looks really fast with a great result :) Nice to see some more samplers and stories . Hmmmmm machine applique? 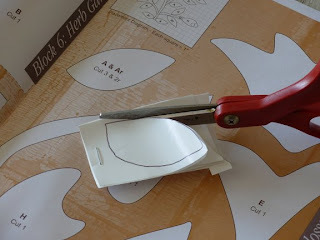 I've always done hand applique, but what the heck I'll give it a try. Thank you for the pictures/tutorial. this tutoria is very interesting...i must orove to make one...iìm waiting for the others instruction! I enjoyed your post on applique. I use a sewing machine given to me by my mother-in-law from the 1940s, and it doesn't even have zig zag! The samplers you have shown are beautiful as well as the stories that go with them! Thanks for sharing these. I've tried machine applique but not the way your showed. I'll have to give them method a go next time. Thanks for sharing. Oh my more samplers, I love them all! Hope you had a great holiday. 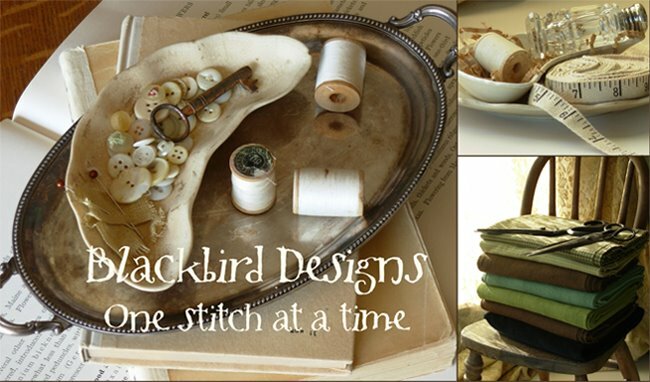 I was wondering what brand of thread you use to machine applique. I'm having trouble finding thread that matches the soft colours of your fabric. Thanks to you and Barb for your inspiration. I have a question...is there a reason you use freezer paper for your templates instead of water soluble paper stabilizer? That would eliminate the need to clip the backs to get the paper out. But it would add to the "bulk" with all those appliqué layers left intact...Just wondering.